As authorized by the Internal Revenue Code, an Employee Stock Ownership Plan (ESOP) is a tax-qualified retirement plan designed to invest primarily in the shares of the company sponsoring the ESOP. The Code contains specific tax and financing provisions just for ESOPs. As a result, in the right situation an ESOP is a powerful tool that can meet multiple goals and objectives of the business owner. To determine if an ESOP is a good fit, a business owner must utilize experienced ESOP advisors, like Olson Mills, that can help the owner determine if an ESOP is the right piece of the puzzle. An ESOP obtains shares by buying them with company contributions, by the company contributing shares, or in the more common scenario for private companies, by borrowing money to purchase a large block of shares. Employees of an ESOP company receive beneficial shares of company stock under the terms of the ESOP, thereby becoming owners of the company. Upon termination of employment, former employees receive cash for their shares or shares which are then converted to cash. Both C corporations and S corporations may sponsor ESOPs. The NCEO estimates that in 2016 there were 6,700 ESOPs covering 14.1 million participants with a total value of employer securities of $270 billion. Link to list of 100 largest majority employee owned businesses in the United States. Why consider an Employee Stock Ownership Plan? ﻿﻿In addition to being a valuable retirement plan, an ESOP is also is an extraordinary corporate financial and tax-advantaged tool for the closely held company. An ESOP pays shareholders fair market value for the company shares they wish to sell and can raise capital by utilizing tax-favored financing that includes tax deductible payments. ESOPs permit employees to take an ownership interest in the company and share in its success. Studies have shown that during the last recession employees of ESOP companies were 1/3 to 1/4 less likely to be laid off than those of non-ESOP companies. Studies have also shown that ESOP companies are more productive and profitable than non-ESOP companies in the same industry. Please click on the button below to open a copy of our booklet on ESOPs for the Closely Held Company. It goes into greater detail about ESOPs, how they work, and their advantages and disadvantages. The initial step is for the owner or owners to determine their goals for their ownership interest. - hire a financial advisor to assist in the determination of the price the trustee is willing to pay. (Note the trustee's advisor and counsel are separate and independent from the owners' advisor and counsel to avoid conflicts of interest. The Department of Labor is especially sensitive to possible conflicts when auditing ESOPs.) The advisor will review the past 3-5 years of company financial data along with reviewing management developed projections for the next 3-5 years. The advisor will present the trustee with a valuation range for which company shares can be acquired. Trustee counsel will complete a legal due diligence review of the company and the proposed transaction. While every transaction is unique, this process will normally take 4-6 months to complete. Click on the button below to view a free 1.5 hour webinar on ESOP feasibility from the NCEO. It includes detailed sections on transaction financing and stock valuation. 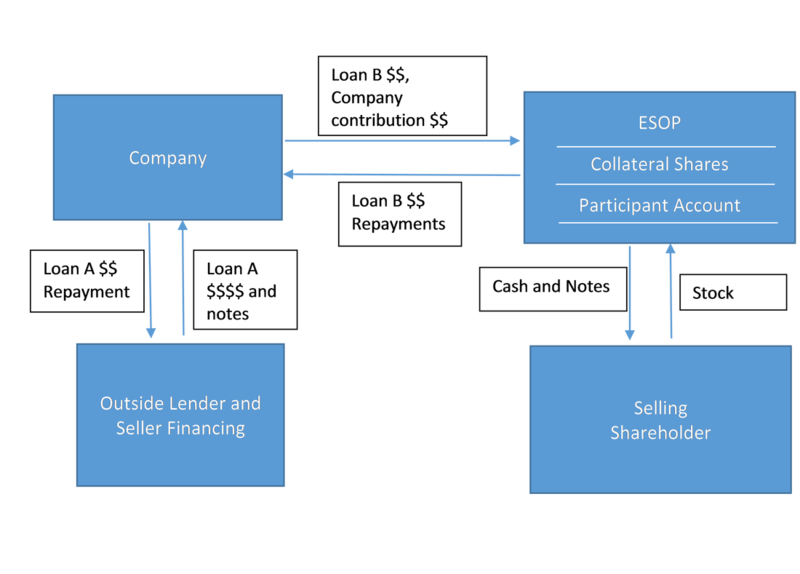 While the chart below shows a typical leveraged ESOP transaction, most ESOP transactions have unique characteristics which may not be reflected in the flowchart. Our ESOPs for the Closely Held Company booklet contains a more detailed example of how seller financing can work. A good advisor team that will look at multiple options and develop the financing terms and other transaction specifics that meet the objectives of all parties is essential. 1. The Company adopts an ESOP and borrows money [Loan A], typically through a combination of an outside lender and seller financing (promissory notes to the seller.) These funds are then lent to the ESOP [Loan B]. The Loan proceeds then are used by the ESOP to purchase stock from the Shareholders. The Company stock purchased by the ESOP is held in trust in a collateral account for Loan B by the Trustee. 2. The Company makes tax deductible contributions to the ESOP each year to permit the ESOP to meet its Loan B payment obligation. These dollars are paid back to the Company as Loan B payments. The Company then repays Loan A with these now pre-tax monies. (If the terms of the 2 loans do not match, and they often do not, more or less money may be due on Loan A than is due on Loan B.) Loan payments may also be made using dividends on the Company stock. 3. As Loan B is repaid by the ESOP, shares of Company stock held in the collateral account are released from that account and allocated to individual participant accounts in the ESOP. The calculation of shares released from collateral and their allocation to participants are both done in accordance with the plan document.